Reading through the stuff out there - it feels a little like all the different possible combinations of Batman stories have already been told. I mean - unless it's Grant Morrison of course (probably one of the few people out there able to push and pull the Dark Knight into strange new shapes). But - everyone else prefers to follow the same old established template: there's somekind of crime with new supervillian/old established favourite up to somekind of mischief - Batman does some detecting - big fight at the the end - roll credits. The thing that makes Batman: Snow so nice is the way that it goes off the beaten path and finds a new type of Batman story to tell: and does it with a Batman that's less Tim Burtony dark and brooding and sticking to the shadows and more Adam West: slightly goofy looking and with lots of exuberant sound effects. I'm going to admit that part of the reason I picked this up was because it had J. H. Williams III's name on the cover: and if you've ever seen his artwork in Promethea, Desolation Jones or Batwoman then you'll know why I'd be hungry for more. Thing is (and it took me a few pages to figure this out) is that here he's actually doing the writing and not the artwork: not that I minded too much - Seth Fisher (who did the trippy and delighful Green Lantern: Willworld) does a beautiful job with lots of bouncy intricate artwork that has lots of spaces for your eyes to get lost in. 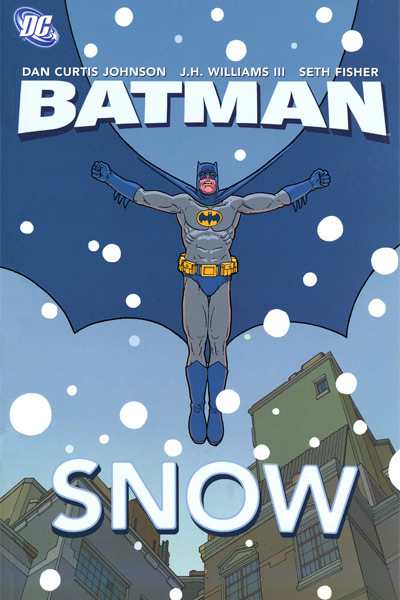 Links: Are You A Serious Comic Book Reader Article: Snow Days: Batman versus Mr. Freeze in Batman: Snow, Supervillain Article on Seth Fisher. Further reading: Green Lantern: Willworld, Batman: The Black Glove, Batman: Year One, Planetary: Crossing Worlds. Profiles: J. H. Williams III.